Moto3 saw race day at Phillip Island get of to a great start for the home fans as after frantic lead changing and barging it was to be Jack Miller who blocked and weaved his way to win the Australian Moto3 Grand Prix, holding off the advancing Hondas over the final lap. It is the first time that the Red Bull KTM rider has hit the podium when starting off the front row, resulting in a win, his fifth, by just 0.029 – with just 0.2 second covering the whole of the leading group over the line. Championship leader Alex Marquez lost five points but remained in control after pushing forward to secure second, with his Estrella Galicia team-mate Rins beaten in the drag to the line in third. Efren Vazquez just scraped past his SaxoPrint-RTG team-mate John McPhee to fourth, with the British rider holding his own well despite injury in fifth. Alexis Masbou held on despite a few wobbles for sixth and was the last of the leading group to cross the line after a nudge from Miller skittled off Brad Binder and Danny Kent. Binder salvaged the final point for Ambrogio in 15th, with an angry Kent 20th. Miguel Oliveira was the best of the rest for Mahindra in seventh, ahead of Team Calvo’s Jakub Kornfeil in eighth and Niklas Ajo, who recovered well after a big qualifying crash for ninth. Niccolo Antonelli completed the top ten. The remaining points were sorted out in a big battle between Francesco Bagnaia (Sky Racing Team VR46) who made up 16 places for 11th, Jorge Navarro (Marc VDS) in 12th, Karel Hanika (Red Bull KTM Ajo) in 13th, Alessandro Tonucci (CIP) in 14th and Binder who regained composure for the final point. Romano Fenati was one of a handful of crashers, running in the lead group until the closing stages. 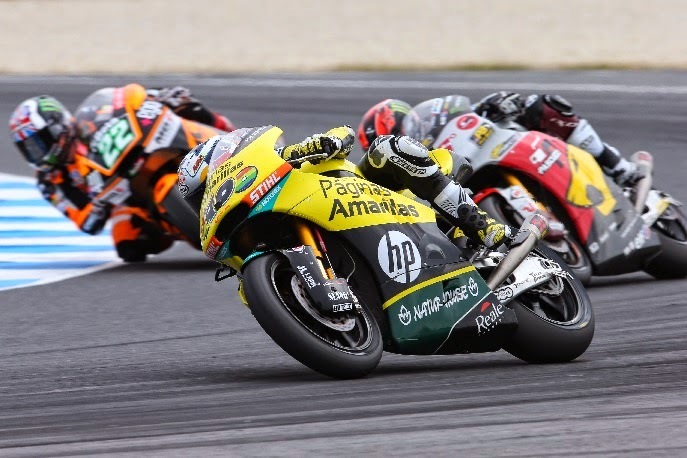 Moto2 saw Maverick Vinales take his third win in his rookie and only Moto2 season, the first rider in the class to not be on pole to win at the Island as the Marc VDS riders braking issues at the breezy track kept the title alive for another round. The Paginas Amarillas rider graced the front several times as the lead group of five struggled with tyres, braking and the wind, pulling out a small lead in the closing stages with a fastest lap in the race to take the win. Tom Luthi manoeuvred his way into second to build on his good form after taking the win in Japan, pushing to finish 1.329 seconds behind his Spanish race rival. Tito Rabat staged repeated recoveries for third, the Marc VDS rider continually needing to work his way back to the front as he found the going tough. The championship leader did enough to pass his team-mate and main title rival Mika Kallio, who saw the points difference extend to 41 as he finished off the podium in fourth. Fifth fell to Sam Lowes for Speed Up at a track where he has some previous experience, the Brit ran as high as second in a competitive performance, his best Moto2 result. A late crash for Johann Zarco left Sandro Cortese to cross the line in sixth, off the pace of the leaders for Dynavolt Intact GP, ahead of a best Moto2 finish for Tech3 rider Marcel Schrotter in seventh. Dominique Aegerter took eighth and Gresini’s Xavier Simeon Ninth as he raced Jordi Torres to the the line, the Aspar man forced to settle for tenth. Taka Nakagami (Idemitsu Honda Team Asia) finished 11th , Louis Rossi (SAG) 12th, Franco Morbidelli (Italtrans) 13th Lorenzo Baldassarri (Gresini) 14th with Jonas Folger (AGR Team) taking the final point. Gino Rea recovered to 21stafter a difficult start and set up struggles, one place ahead of top home rider in Moto2 Ant West in 22nd. For the full Moto3 results click here,and for Moto2, here.